Successfully Added Watch MP3 Player 2GB - Multi EQ Modes to your Shopping Cart. Watch MP3 Player 2GB - Multi EQ Modes. 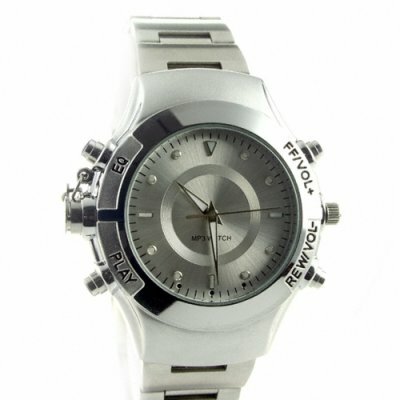 Metallic silver quality watch with a hidden 2GB MP3 player built in and with 5 EQ modes to choose from. This fashionable geek gadget will warm your heart with its unique features such as its MIC and Line IN audio recording in WAV format, its water resistant and shock proof design for everyday wear, and its rich playback of MP3 and WMA files. Mix fashion with music with this very unique MP3 player. In stock now for single piece or bulk orders. From your home for factory direct wholesale electronics - Chinavasion.